The Facebook recommendation box is an often missed Facebook tool for business marketing. Most people don’t even know it exists! If you’re one of the small business owners saying “Recommendation, huh, what?” then this quick tip is for you. And I mean quick, it only takes a couple of seconds to add this wonderful little bit of functionality to your Facebook page. Facebook recommendations is a section found near the top of your Facebook business page where customers can leave a recommendation for your products or services. It’s just like the comment box, but it’s a specific invite for recommendations. To add this lovely feature to your biz page, simply head go to Edit Page > Update Info > Basic Information. 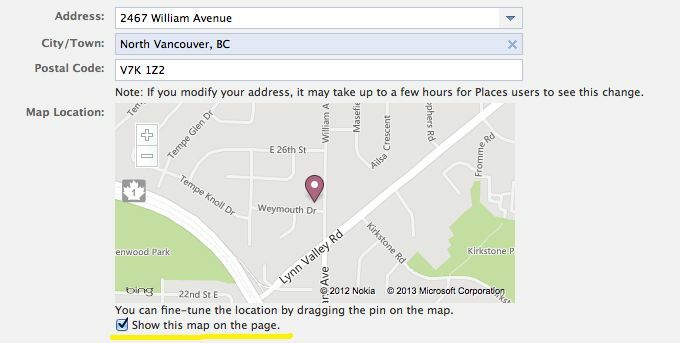 You will then have to add in a physical address and check the box “show this map on the page”. Checking this box is what enables the recommendations. After you do this, you will now see a map box along the top icons of your page, as well as the recommendations box in the right hand column. Recommendations will only work for pages that have a physical address listed. If don’t see an option to add an address, then the category you have chosen for your page does not support communicating a physical location. If you want to enable recommendations, you will first have to select a category that does, so you may have to play around with this a little. Do you have recommendations enabled on your Facebook page? What have you done to get recommendations for your small business? Previous post: Eek…I received spam complaints on my email newsletter! Next post: Do you make it easy for people to love you? Work those testimonials!